Hassium, atomic number 108, is a synthetic transactinide element. Though early experiments in the late 1970's by the Russian research team of Turi Oganessian and Vladimir Utyonkov at the Joint Institute for Nuclear Research, it is unclear from available data whether they were successful. 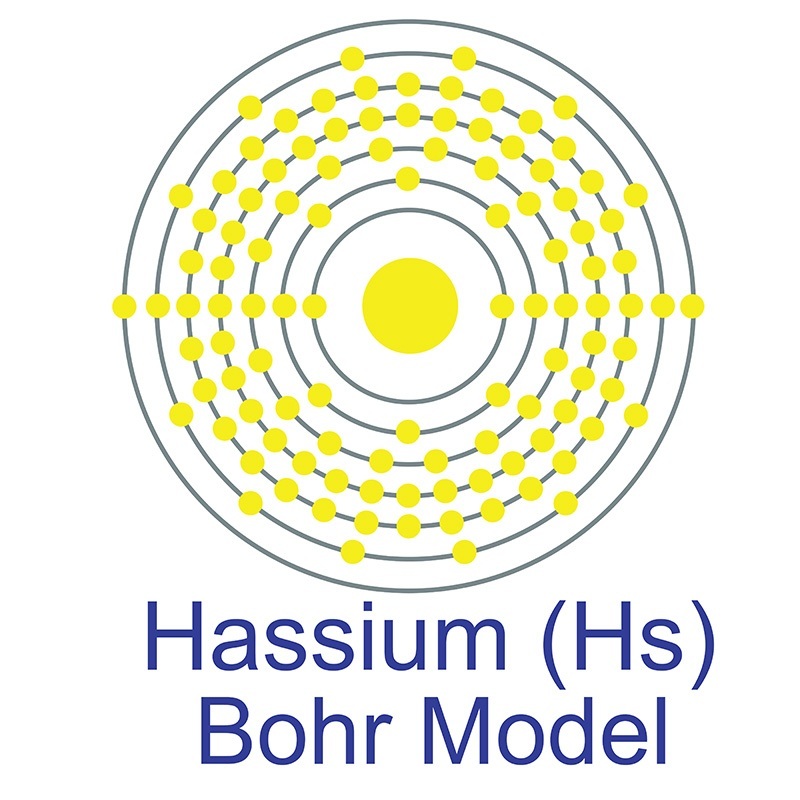 The official discovery of Hassium has been credited to the German research team of Peter Armbruster and Gottfried Munzenberg at the Institute for Heavy Ion Research in 1984. The naming of hassium was a contentious one, and wasn’t resolved until 1997, when the IUPAC gave in to the discovering team's desire to name the element for the German state of Hessen, where the Institute for Heavy Ion Research (GSI) is located. Though hassium's instability has precluded extensive study of its chemical properties, many of these can be predicted from its location on the periodic table. As a member of the group 8 elements, it is expected to have properties similar to those of the platinum group elements, especially its closest homologue osmium. Notably, hassium is predicted to have a density higher than any of the known elements, nearly double the density of osmium, which has the highest density that has been measured. Like many other unstable synthetic elements, hassium is studied extensively in basic science research settings, but lacks any practical applications. Hassium is a D-Block, Group 8, Period 7 element. The number of electrons in each of hassium's shells is 2, 8, 18, 32, 32, 14, 2 and its electron configuration is [Rn] 5f146d6 7s2. In its elemental form, hassium's CAS number is 54037-57-9. Hassium's appearance is unknown but it is suspected to be silvery white or metallic grey in color. Hassium is a synthetic element that is not present in the environment. Little is known about the element and it has no known uses. Hassium was first created in 1984 by a team headed by Peter Armbruster and Gottfried Münzenber at the Heavy Ion Research Laboratory in Darmstadt, Germany. Its name is derrived from the Latin word "Hassias" meaning "Hess," after the German state. Hassium information, technical data, properties, and other useful facts are detailed below. Scientific facts, such as the atomic structure and ionization energy are included. Hassium (Hs) is an artificial element. Like all artificial elements, it has no stable isotopes.